It’s official: Kate is here and Kate ROCKS! I write this on a rainy Sunday morning. Lydia is napping, and Son and I are resting our bodies and focusing on paperwork and other indoor farm tasks…even our “days off” tend to be “on” to some extent! Last weekend, our apprentice, Kate Jones, moved in, and now that a week of working and living with her is done, I think it’s safe to say that we’ve got ourselves a winner! She’s done a great job so far, and her first week here on the farm was definitely a busy one. With the passage of the area’s traditional frost date (and we did get a light frost last Monday night…we wisely covered all of our vulnerable crops), we’ve been planting like crazy. Now in the ground: 5 beds of tomatoes! Strawberries! Cukes! Melons! Summer and winter squash! More lettuce! Chard! Hooray!!! Ironically, Kate is now gone for a couple of weeks to visit her family in Illinois, but we’re actually running ahead on our planting schedule and feel confident that we’ll manage until her return. 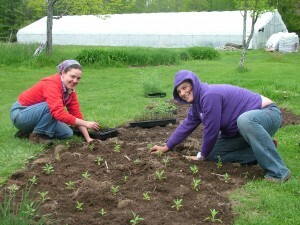 In the photo below, she’s helping Sonya plant herbs in our brand new herb bed, carved into the yard near the house. Thanks, Kate, and welcome to Summit Springs Farm!!! One Response to It’s official: Kate is here and Kate ROCKS! Thanks you guys. I am glad that I made my first week worthwhile that I could leave for 2 weeks. I have made it safely to IL and am now enjoying time with my family. Hope things are going well and you get some rain this week.